We had the most wonderful day of services on Sunday. Our preacher had the liberty to preach all day and really got our minds working and our hearts stirred. After the evening preaching we had an old-fashioned bouquet service. I had never been in one before, but it was the most fantastic time of love, fellowship and appreciation - we really needed it! If you've never been in one either, the idea is to share flowers and love now instead of waiting to spend money on a funeral spray, once it's too late. Everyone brings flowers from their garden or a pre-made bunch from the store and they're all cut to be boutonnieres. 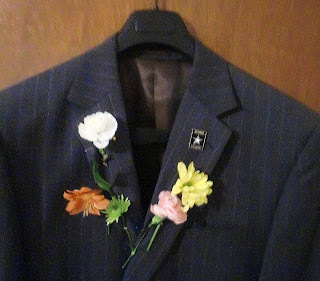 The church's Pastor Emeritus had us pin the Preacher and his wife first, and then everyone had the opportunity to take as many flowers as they wanted and pin as many people as they wanted. The beauty of this service was that it became an opportunity to apologize, give thanks and tell someone that needed it how much you love them. Our Preacher and Pastor Emeritus were covered in flowers, a true testament to their impact on our congregation. 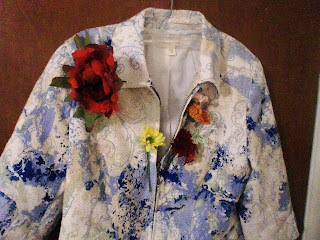 Others had them stuck in button holes, tucked behind their ears and one woman even made some special ones with butterflies in them. It was such a powerful evening for everyone - no one left without a flower, we made sure of that. Even a young visiting couple received flowers and hugs. We tend to wait until serious times to share how we really feel, but this bouquet service showed us just how important constant edification and affection are.